When Diamond Dave was first rescued back in March, he was 5 weeks old - but weighed only as much as a 2-week-old. The baby badger was hungry, dehydrated and completely helpless, without a mother in sight. He had been found by a person's dog and, from there, was taken to the Secret World Wildlife Rescue, based in East Huntspill, England. After a few days spent in Secret World's care, Diamond Dave went from being a weak, hungry badger to a responsive, playful one. But as Diamond Dave began to crawl around more frequently, one of his caretakers noticed that something was wrong with the way he moved. "Jess has noticed that he isn't placing his front foot in the correct position and it seems to knuckle under," the rescue wrote on Facebook. "Diamond Dave was found as a single abandoned orphan, which can mean that the mother has deserted the youngster as it has problems." Diamond Dave was taken to a veterinarian, who took a look at the baby's badger's leg. Thankfully, the issue was neither permanent nor life-threatening. The problem with his foot came from ligament and soft tissue damage - a likely result of Diamond Dave being without food and not moving for an extended period of time before his rescue. Knowing that the badger would need to have two working front paws to return to the wild, so that he'd be able to fight and dig, the team created a physical therapy program for Diamond Dave to help restore normal function back to his leg. He was also paired with another baby badger named Jasper, an orphan who was found weak and starving just like him. The two hit it off right away and it wasn't long before they became the best playmates, and nap buddies as well. As it turns out, playing with Jasper greatly helped Diamond Dave's condition improve - Jasper gave Diamond Dave a reason to move around and further exercise his injured leg outside of his physical therapy sessions. "With his exercises and playing with Jasper, Diamond Dave's leg looks so much better," the rescue wrote on Facebook in late March. "They are both still not strong enough to walk properly but enjoy having each other for company. Jasper quite likes using Diamond Dave as a pillow!" Today, Diamond Dave is no longer the small baby he was back in March - and he continues to grow each day. "Dave has almost no contact with humans now as he's learning to be a wild badger," the rescue wrote on Thursday. He's since been moved to an outdoor enclosure where he's gained a few more badger friends, and where they'll learn natural behaviors together and eventually be released back into the wild. 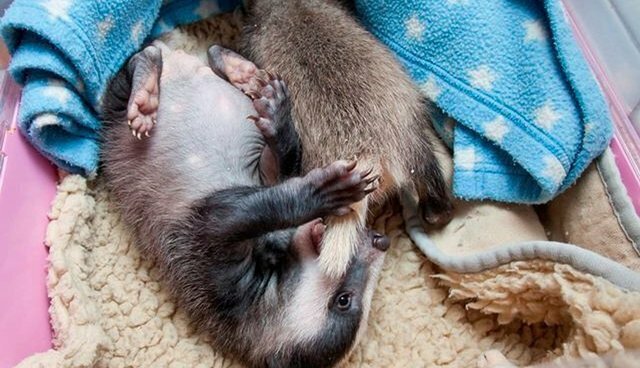 "It's amazing to think how far this little badger has come since he was picked [up] by a dog back in March, just a tiny baby," Secret World wrote. Want to help Secret World Wildlife Rescue continue doing good work for animals in need? Consider making a donation here.